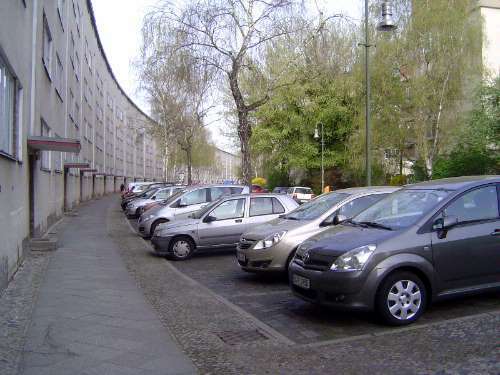 Berlin grew quickly after German unification in 1871. From a population 412,000 in 1849, the city rose to a million by 1900 and two million by World War I. 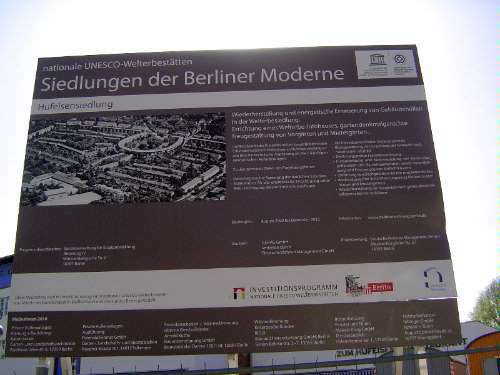 Despite losing that war, by 1920 Berlin had almost four million people and was the third biggest city in the world, after only New York and London. There was little to celebrate for most of the city's residents. By 1920, 90 percent of them lived in tenements, and 90 percent of those tenements lacked bathrooms. 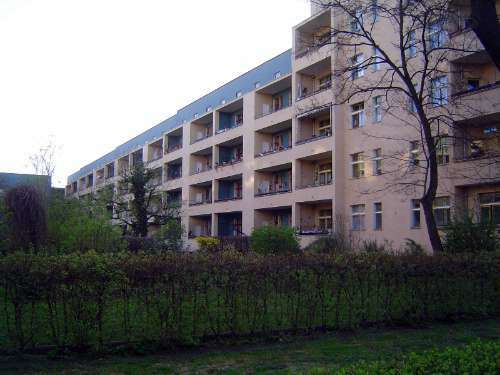 In that decade, however, the city embarked on a spectacular program of building public housing. 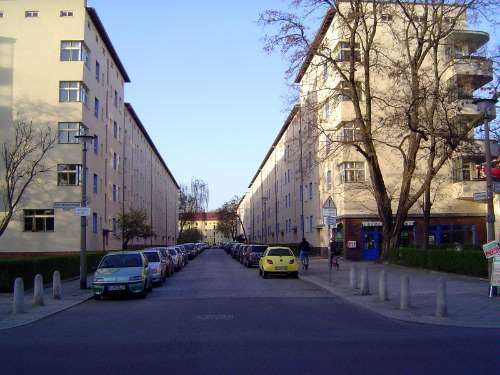 Between 1924 and 1930, when the program bumped to a halt, 135,000 apartments were constructed. They were dramatic architecturally, too. 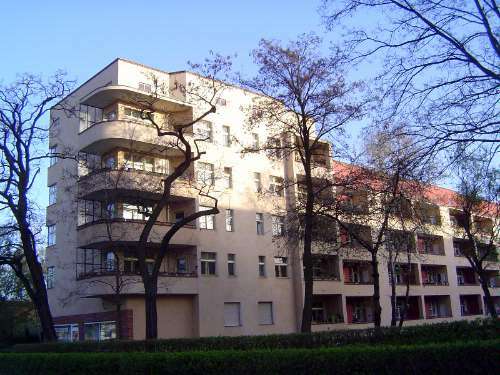 The leading architect in the program--he alone designed 10,000 apartments in that handful of years--was the modernist Bruno Taut. Nearly a century later, several of his estates survive. Here we look at the group--some by Taut; some by colleagues--protected since 2006 as a UNESCO World Heritage site. No, this isn't one of them. We're after places that are much denser, more packed. 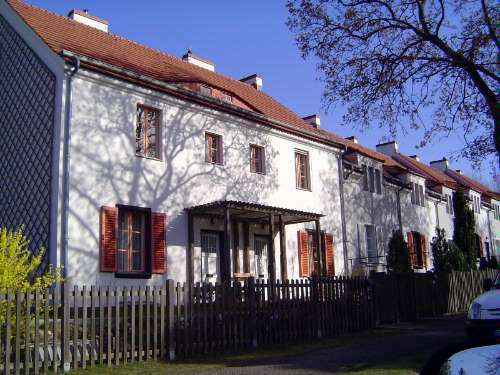 They have names, of course: they are the Gartenstadt Falkenberg (1913-16), the Siedlung Schillerpark (1924-30), the Grossiedlung Britz commonly called the Hufeisinsiedlung or Horseshoe Settlement (1925-30), the Wohnstadt Carl Legien (1928-30), the Weisse Stadt (1929-31), and the Grosssiedlung Siemensstadt or Ringsiedlung (1929-31). All lay outside the city as it appeared in James Hobrecht's master plan of 1862. For all five, the prime directive was Luft, Licht, und Sonne, "Air, Light, Sun," all to increase Aussenwohnraume, "outdoor living spaces." 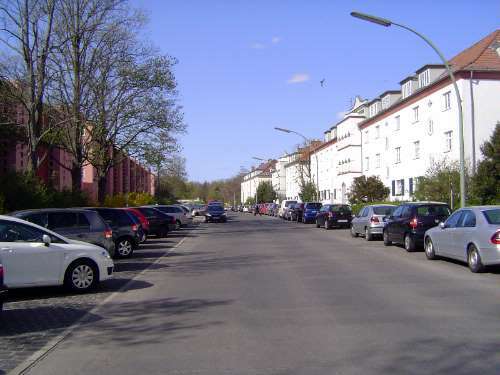 That's what brings us to this quiet street, Wegedorn Strasse in Siedlung Wegedorn, a southeastern suburb of Berlin. 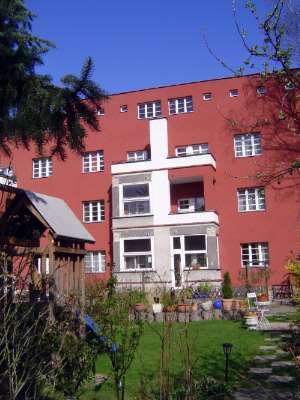 These houses have the "air, light, and sun" Taut sought. 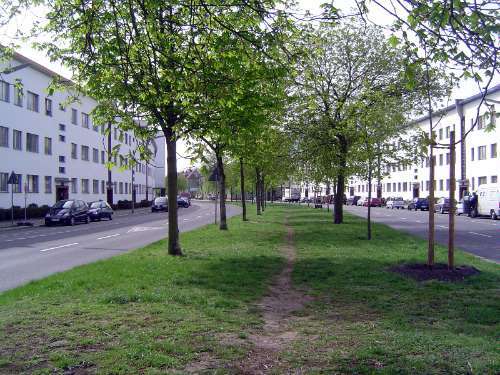 As this picture suggests, it was hardly a revolutionary aim, but he and his fellow architects had to provide it in a much more tightly packed space. 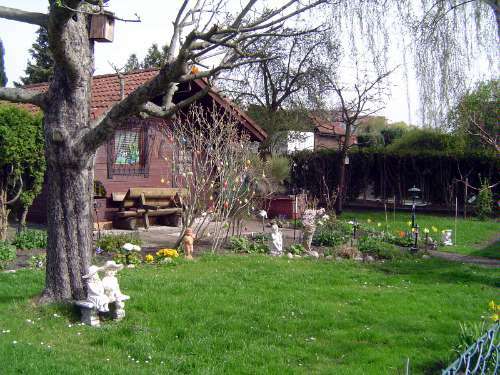 Snug and tidy, and less than 10 miles southeast of the city center. How to pack the houses tighter? Here's an early answer from Taut. 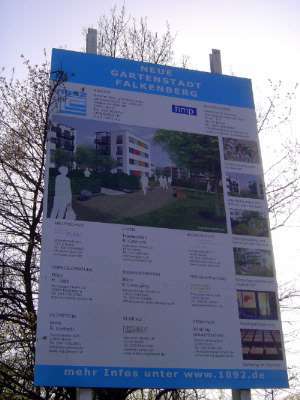 It's the Gartenstadt (Garden City) Falkenberg, perhaps a mile south of the freestanding houses on Wegenerstrasse. 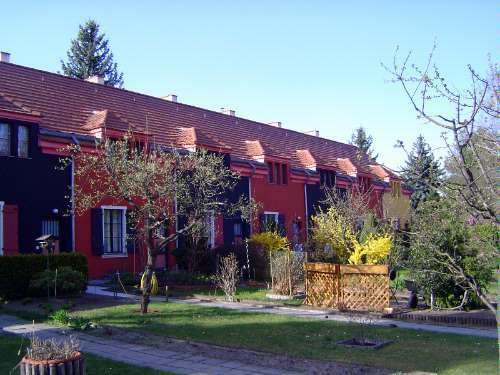 These rowhouses are also conveniently located near the commuter-rail station of Grunau. 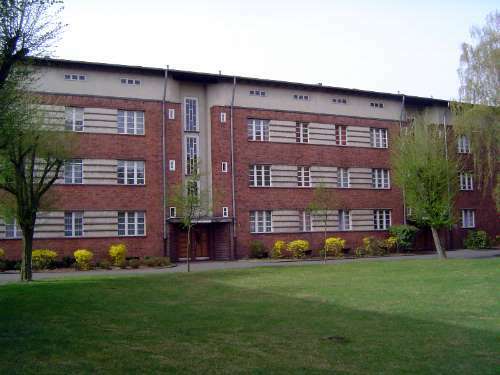 The design is amazingly close to California's Parkmerced and Park LaBrea, both built by the Metropolitan Life Insurance Company after World War II, but Gartenstadt Falbenberg is much older, from 1913 to 1916. 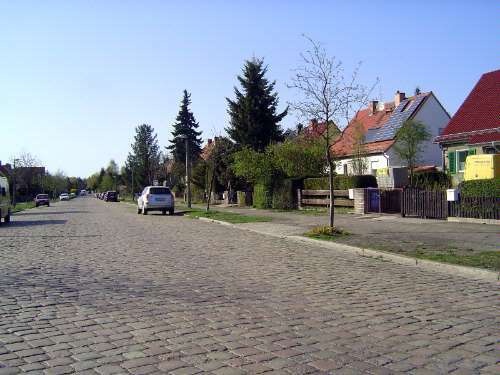 Taut at the time was the architect of the German Garden City Society (the Deutsche Gartenstadtgesellschaft). 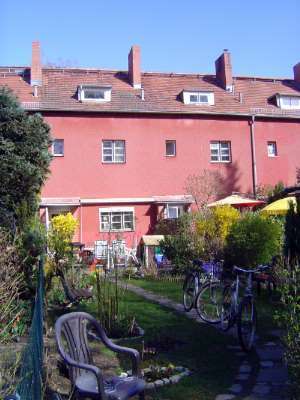 Funding came from the Greater Berlin Non-profit Garden Suburb Cooperative (the Gemeinnutzige Baugenossenschaft Gartenvorstadt Gross-Berlin eGmhB). 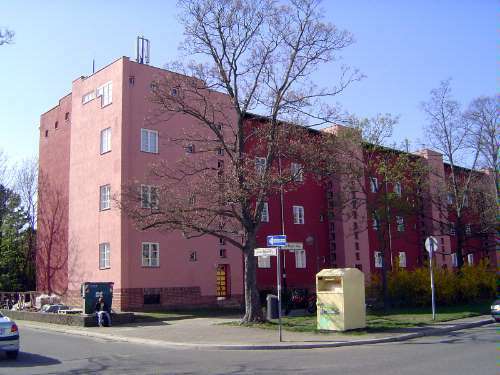 Plans called for 1,500 flats, but only 128 were built before World War I stopped the program. The nickname was the Paintbox Estate--a reference to Taut's choice of strong colors. Originally the label was pejorative, but it has stuck and lost its sting. The philosophy underlying the project was to provide housing for families with varying incomes--and to give even the poorest a dedicated bathroom and kitchen. 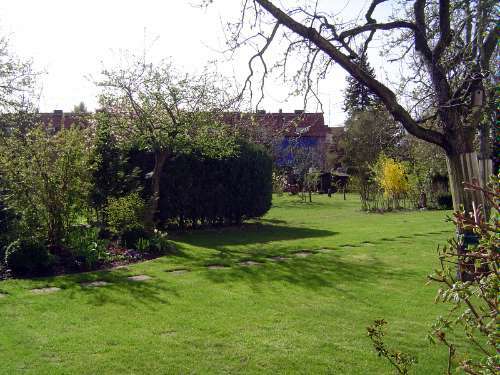 The garden-city esthetic is suggested also by the gardens themselves, which were conceived as vegetable patches. 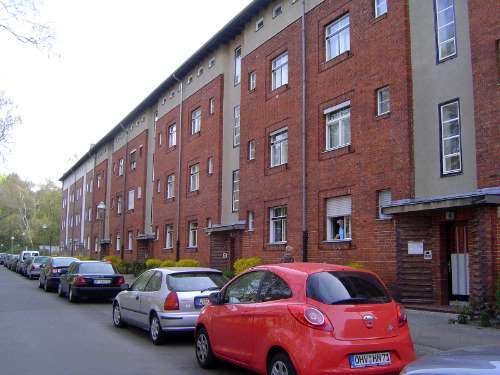 Taut included this variant, just across the street and in many ways a precursor of the still-denser settlements to be built after the war. Surprisingly, perhaps, the settlement continues to grow a century later. The design is no longer so traditional, but "air, light, and sun" are still the goals. The name is unchanged, too. What came next? One answer is: stylistic warfare. 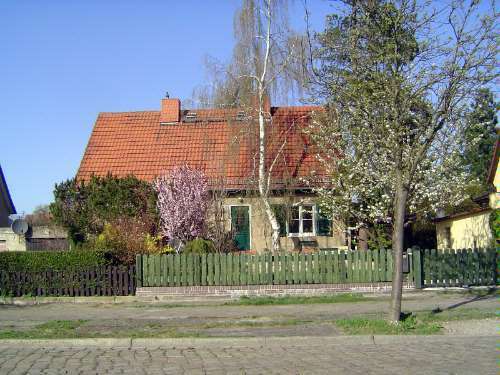 The site is in Britz, perhaps five miles closer to Berlin's center and a few miles southeast of Templehof Airport. Here the city put two developers to work. 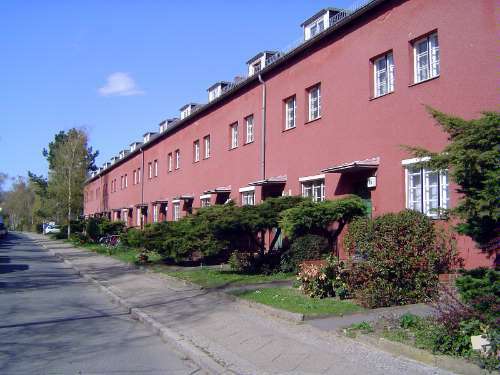 On the right is the traditionalist estate built between 1925 and 1927 by DeGeWo, the Deutsche Gesellschaft zur Forderung des Wohnungsbaus (the German Society for Promoting Housing Construction). 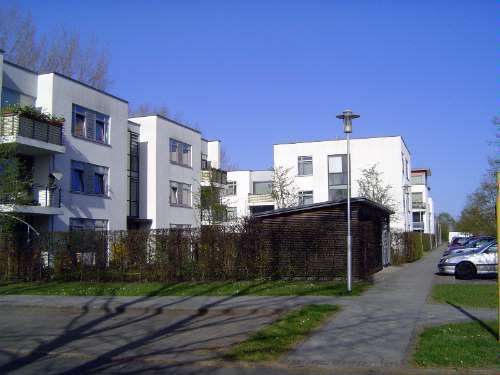 On the left is Taut's Grosssiedlung Britz, built by GEHAG, the Gemeinnutzige Heimstatten-, Spar-and Bau-Aktiengesellschaft (Non-profit housing, savings and construction shareholding company). The nickname was Red Wall or Chinese Wall. 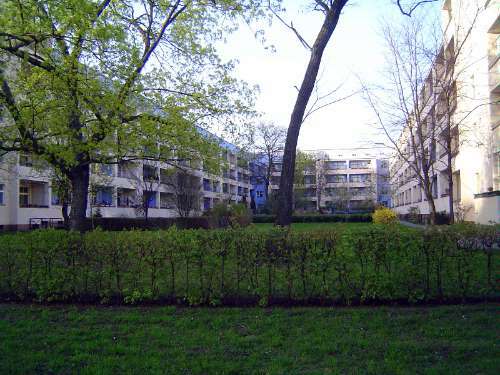 This project was Berlin's first estate with more than a thousand flats. 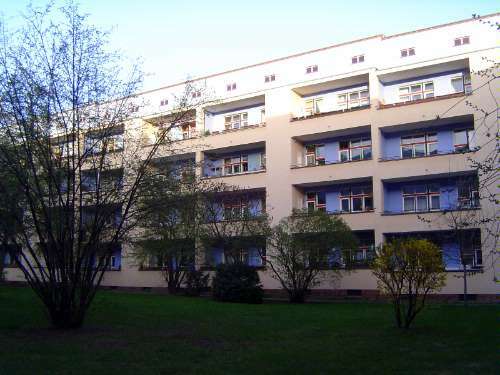 The rear of the building shows the small balconies and garden plots incorporated into the design. One of the project's two-story sections. It may look terribly dull, but Taut was extraordinarily ambitious. In 1918 he wrote: "Art and the people must be united to form one entity. Art shall no longer be the preserve of a selected few but a source of happiness and life for the masses. The aim is to unite the arts under the umbrella of great architecture. From now the artist, shaper of popular sensibilities, bears sole responsibility for the visible appearance of the new state." 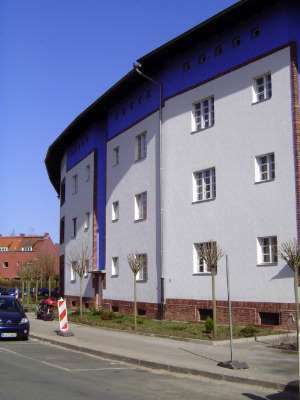 Rear of the two-story section. 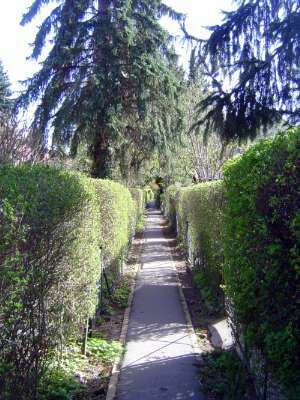 A sidewalk running between two ranks of backyards. Another bit of shared park. Here you can see the origin of the project's nickname, the "Horseshoe Settlement." You can also see the diamond-shaped park just at the top of horseshoe. 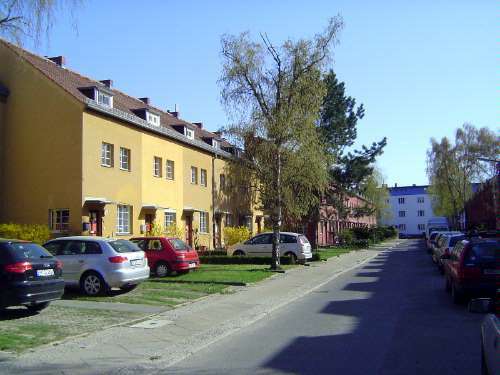 The Red Wall is the line of rowhouses at the top of the picture. Here's the outside view of that horseshoe. It's a curved facade of 360 meters. 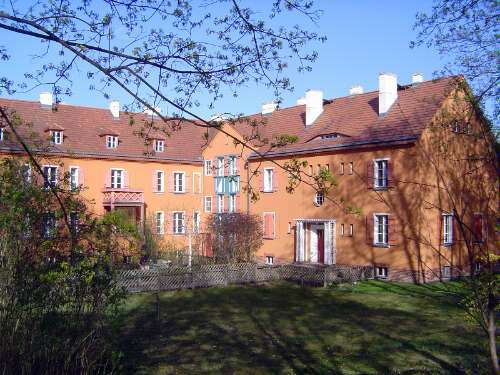 The interior, with tenant's gardens, was being renovated in 2011. Taut had to work within a fixed, gridded street layout and so laid out six U-shaped structures, with the open side of three of them facing the open side of the other three. 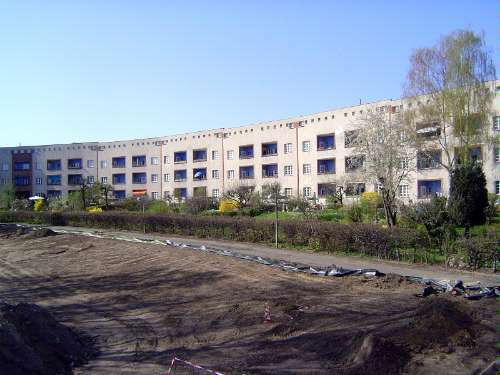 Here's one of the courtyards formed by the U-shape. The color is perhaps the most obvious relic of the Paintbox Estate he had built before the war. The blue, by the way, is called Taut Blue. 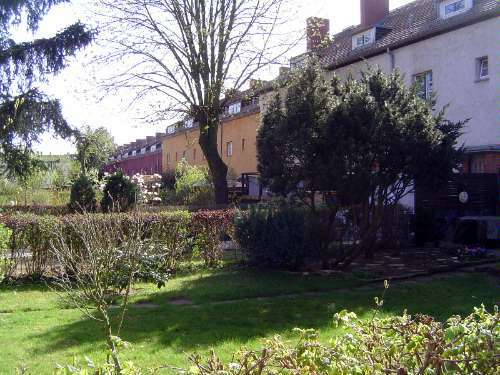 Another view of one of the courtyards, and a glimpse of the hedging that forms the only fence with the street. 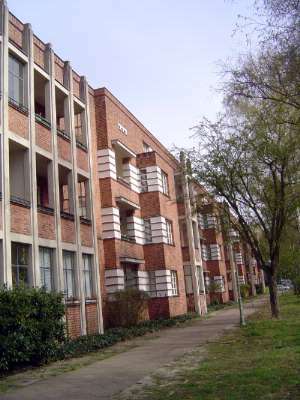 The apartments all had loggias. "Air, light, and sun" were still Taut's goals. 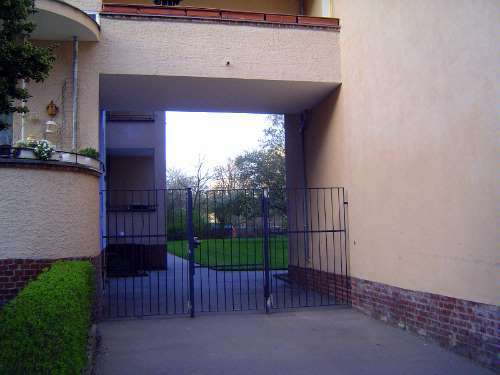 At some point the gates were added. The streets between the buildings are fairly grim. The color was chosen to make them less oppressive. 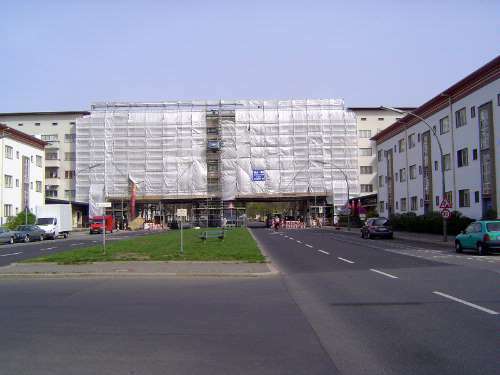 A fourth project, not by Taut, is in the neighborhood called Siemensstrasse, just south of Tegel Airport. 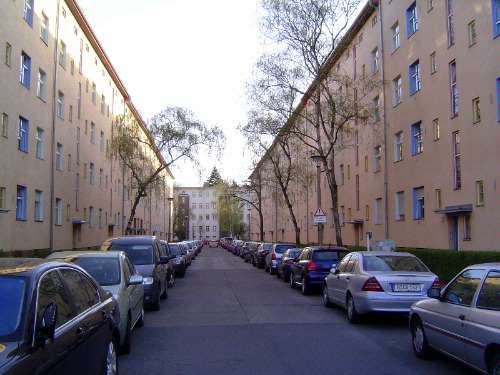 One part of the project, on Goebelstrasse, is this 338-meter-long apartment building by Otto Bartning. Across from it, and much closer to the Taut ideal, is this block, one of many just like it. 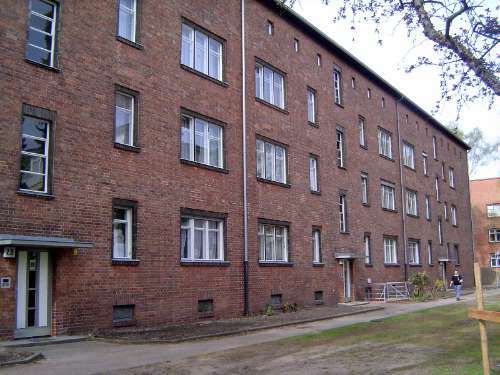 The architect was Hugo Haering. His kidney-shaped balconies sought to provide maximal extension while casting minimal shade. 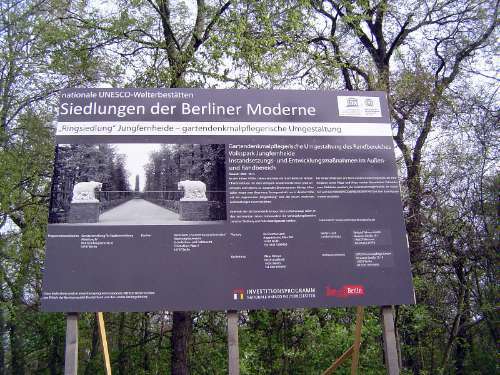 Another sign on the site. 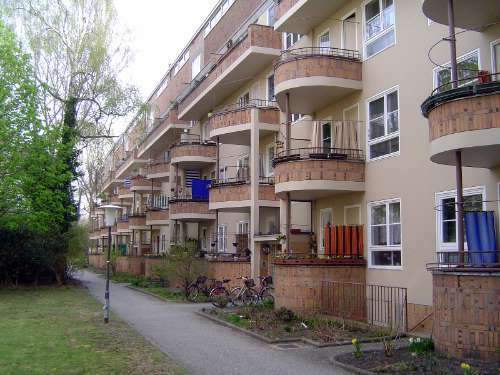 The name Ringsiedlung comes from Der Ring, a group of ten (later 27) architects who aimed to introduce modern architecture to Germany. It provoked a counter-organization called Der Block. 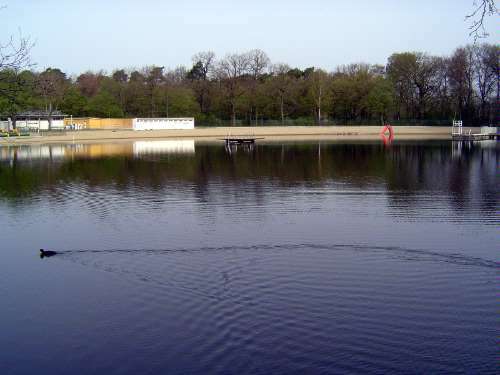 Just north of the settlement and separating it from Tegel Airport is this swimming lake and park, the Jungfernheide or Virgin Heath. 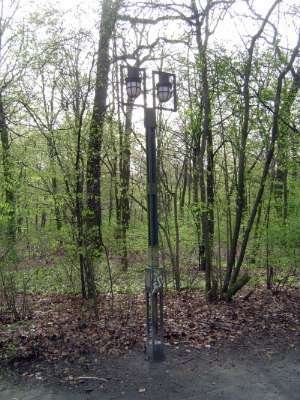 An elegant lamp post in the woods. 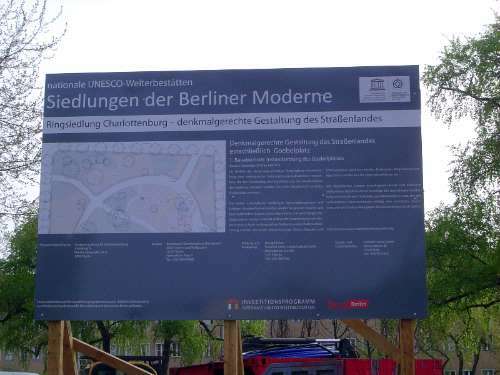 More UNESCO-mindedness. The Wasserturm or water tower in the background is one of many in Berlin that were built to pressurize the mains. It still stands. 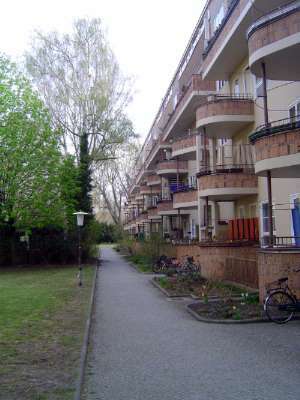 Number five on our tour: Schillerpark settlement, designed in part by Taut. Here's one of his first buildings. The owner was the Berliner Spar- und Bauverein, the Berlin Savings and Building Association. 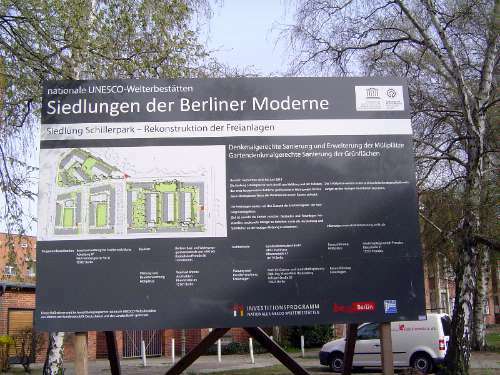 It had acquired the land in 1913; Taut's masterplan was done in 1924. Taut's later buildings were done on a tighter budget. No more plaster or jambs. 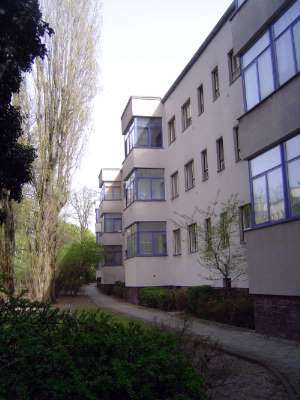 The project expanded further in the 1950s, when these buildings by Hans Hoffmann were added. 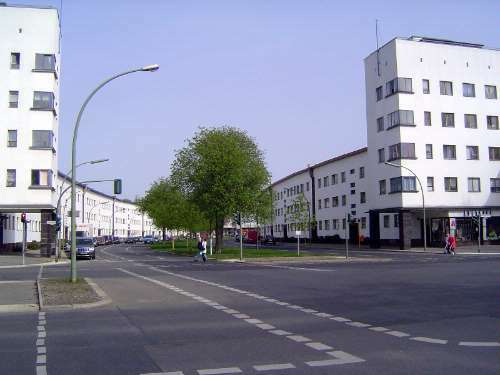 Finally we come to the Weisse Stadt, the appropriately named White City. The main street here curves into the distance, and the beginning of the curve is marked by matching towers on both sides of the street. Here's the view looking back to the corner with those towers. 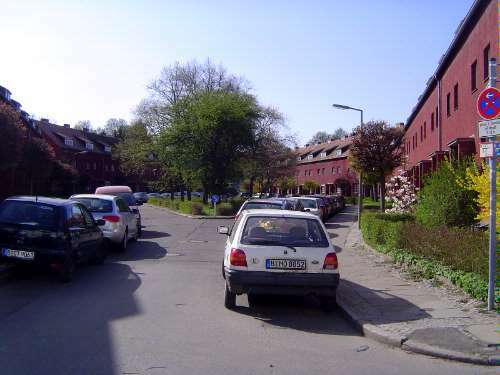 In the other direction, there's a bridge of apartments spanning the street, Aroser Alle. 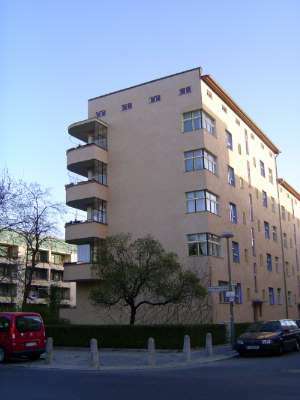 The architect was Otto Salvisberg. 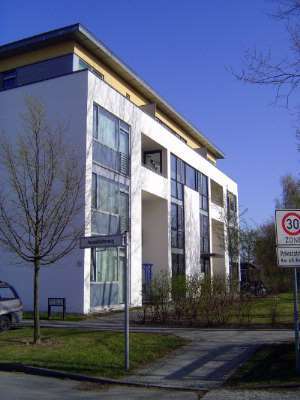 The form is reminiscent of the Bauhaus Building in Dessau, which had been built only a few years earlier. The back of the curved buildings opens on greenspace with glassed-in balconies. 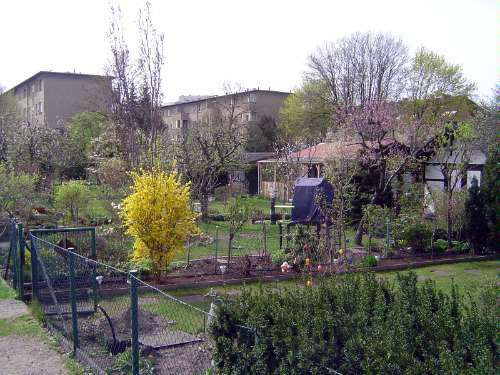 A block away there are some grim DDR apartment blocks, but even here there is a nod to "air, light, and sun" with these small garden allotments. There, apartment dwellers sometimes add cottages decorated with sentimental ornaments that hint at the world before Berlin was a metropolis. 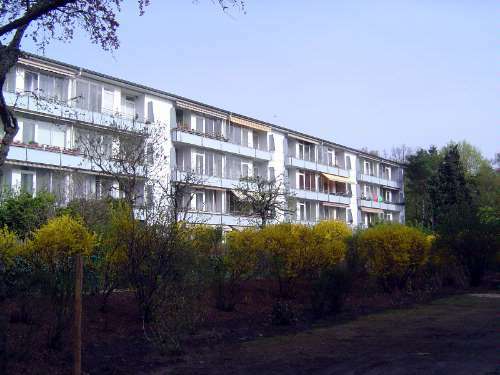 For more information on these developments, see the online (and unusually detailed) Nomination for Inscription on the UNESCO World Heritage List; the title is "Housing Estates in the Berlin Modern Style."